This is a bit off-piste from my usual content and when I got the email from Roe Park Resort asking if the family and I would like to experience 2 night's B&B in this 4* hotel in Limavady, my immediate reaction was that it would be a lovely treat for us all but at the end of the day, not particularly blog relevant....so I asked to have some time to think about it. 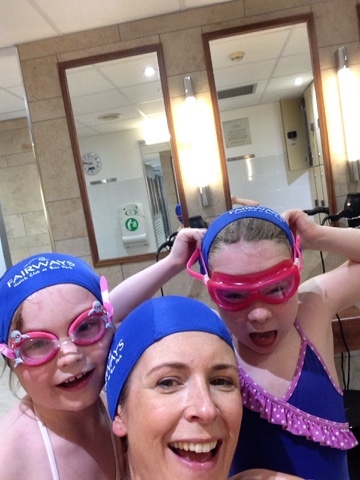 That same week, the kids were talking in the back of the car about bucket lists (yes...at age 6 & 11) and one of the girls said (without knowing about my email) 'all I have on my bucket list is to go stay in a hotel and swim in the pool'. Yes...they're almost 7 years old but we've never stayed in a hotel with them...we've always doubted it could be much of relaxing break having 5 of us sleeping in the one room! I decided this could be the chance to test the family hotel break concept...for us and perhaps for you too if it's something you've wondered about doing. I accepted the challenge and we headed up just a few days before school resumed. 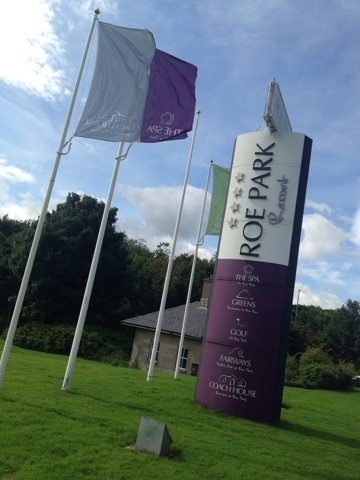 It took us just over an hour to get there from Belfast and first impressions of the Roe Park Resort were good. We got a lovely welcome at reception and across the board, the staff were super friendly and chatty. I've actually stayed at the hotel once before when I was about 34 weeks pregnant with the twins and it still looked as well - 7 years on. We were early arriving so our room wasn't ready but we were allowed to go and use the pool in the meantime. Small gripe at the pool in that you have to wear a hat...and not knowing this in advance, we hadn't brought ours with us. Frustrating but £12.50 later, we were ready to go! ...bucket list about to be ticked! Safe to say the kids loved the pool - it's small enough that you can keep a close eye on them and not too busy either. There is a jacuzzi, steam room and sauna for the over 16's (the 11 year old was not impressed) so hubby and I both enjoyed taking turns at some kid-free time in all 3. The hotel is conveniently located on the Roe River which cuts through the on-site golf course. 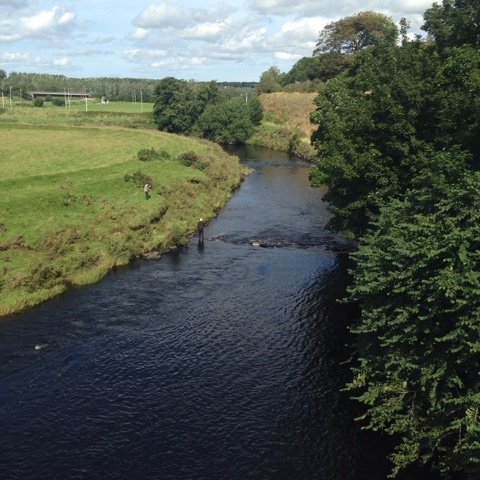 It's a fishing paradise here - we met countless fishermen on our exploration of the Roe Valley trails. With these trails and the nearby town of Limavady, there's really no need for the car on a short break here but we wanted to make the most of the fact that this part of the country is a gateway to the North Coast - to Portrush/Portstewart & the Causeway Coast which we visit regularly already but also to the Lough Swilly coastline, Donegal and Londonderry. 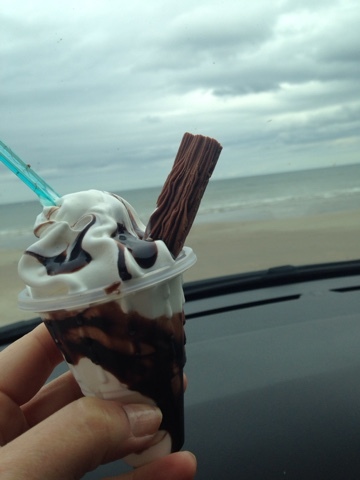 So next day, we took a drive to Benone strand, onto which you can drive the car. 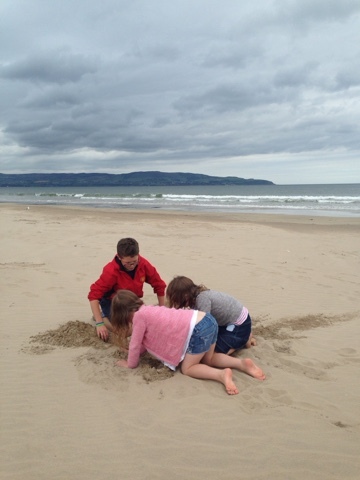 We had a good dry day so the kids had a great time paddling in the sea and building sandcastles. Such gorgeous views to be had here of the Donegal coastline and it has the bonus of being less busy than Portstewart Strand (and free to use). 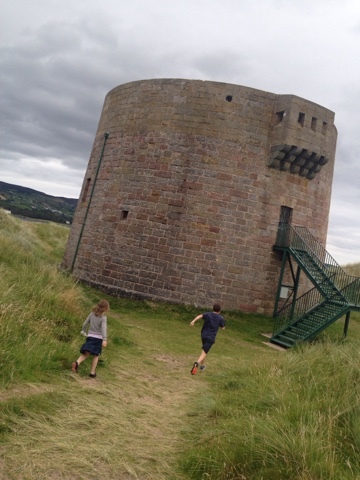 We also visited the Martello Tower at Magilligan....(open this weekend as part of the European Heritage Days). It wasn't open when we were there but there's a lovely walk around it and down to the small beach. 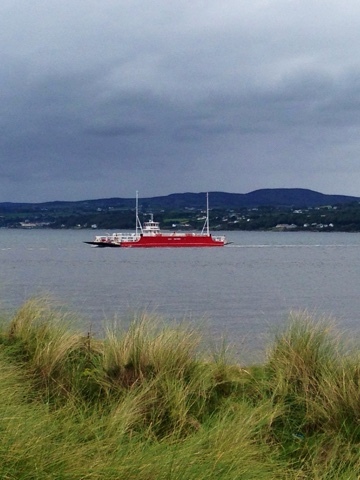 The kids loved running through the dunes and watching the Magilligan/Greencastle ferry coming in and going out - it links Donegal with Derry making this part of the country an excellent base from which to visit across the border. Back to the hotel though and I'm sure you're all wondering how we got on in one bedroom for two nights? It was, erm...'interesting' and I'm not sure I'd want to do it for longer than 2 nights with the kids. Earplugs were our friends! But to see the fun the kids had in the pool (2 long visits each day) and on the beach...and on our walks along the River Roe, it was worth it. And an unexpected benefit was coming home feeling the benefit of having 2 early nights! Next time though? I'm going with just the hubby.....that and a trip to the spa is on my bucket list! 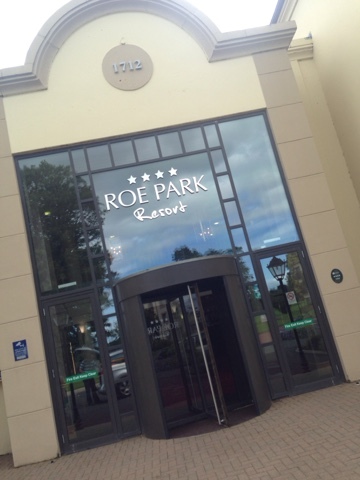 Disclosure - The family and I were treated to 2 nights B&B and one evening meal, compliments of the Roe Park Resort. We paid for all extras (e.g. wine!) and our second day's dinner. I was not obliged to blog about the stay and all the words are my own. 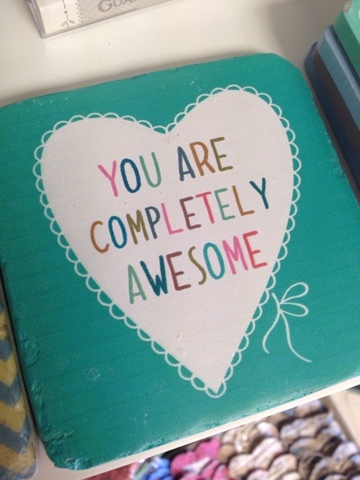 Thank you for supporting the brands and businesses that support this blog. Looks like the kids had an absolute ball Avril - you and Brian def deserve a child-free trip as a reward! What a fabulous time it looks like you had. You can't beat great family moments away from home.